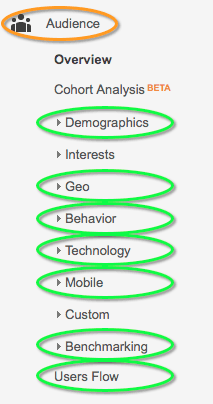 Demographics and Interests are not enabled by default but these can provide information about your users. Please read Google’s explanations carefully if you decide to enable these capabilities. Geo shows you the location and language of your users. Behavior allows you to compare visitors based on whether they are first time visitors during the time period selected or have visited your site more than once in the same time period. You can also see the frequency for each session count, days since a users last sessions, and users engagement. Technology shows you what browser, network and operating system visitors were using. Mobile compares mobile, tablet, and desktop users as well as giving you the ability to see which mobile devies visitors are using. Benchmarking lets you see how your data compares to other websites with the same industry and a similar number of pageviews. Benchmarking might need to be enabled. To do so, follow the link that reads update your data sharing settings and check the box next to benchmarking. Be sure to save your updates. Users Flow gives you a visual representation of the different paths visitors took through your site, including where they dropped off your site.